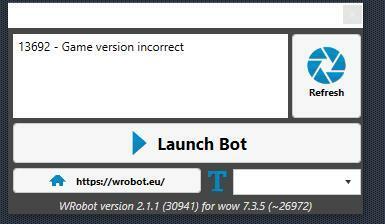 i´ve started the Legion Bot, 1st alle updates installed. My Gameversion is 26972, but when i start the the bot, it tells me wrong version 13692 ? Hello, Can you share your log file please ( https://wrobot.eu/forums/topic/1779-how-to-post-your-log-file-with-your-topic/ ). but i cant get a log from inside the bot, cause the bot tells me game version incorrect. maybe u can use the generatet file but there r no errors. i know and i´ve testet out with my other Clients, but still the same. I try a complete reinstall of Pandaraia & Lgeion. sorry it was my failure. i´ve signet the foldernames wrong. i did a misstake with 32 & 64 bit. now when i choose the right one, all works great.